What Is Very Long Baseline Interferometry (VLBI)? Very Long Baseline Interferometry (VLBI) is a technique where a signal from an astronomical radio source, such as a quasar, is collected at multiple radio telescopes on earth. The distances between the radio telescopes is then calculated using the time difference between the arrivals of the radio signal at different telescopes. This allows the observations of a different object by several radio telescopes to be combined, creating a "virtual telescope" with a size equal to the "maximum separation between the telescopes". A minimum of three antennae is required. Data received at each antenna in the array includes its arrival time as measured by a local atomic clock such as a hydrogen maser. The data is stored on local hard drives. At a later time, all the data is collected on a super-computer and correlated with each other to produce a very high resolution image. The resolution achievable using interferometry is proportional to the observed frequency, i.e. the higher the frequency, the higher the resolution of the final image. The EHT started out at 16 Gb/s in 2015, then 32 Gb/s in 2016, and finally 64 Gb/s in several years. The VLBI technique enables the distance between telescopes to be much greater than that possible with conventional interferometry, which requires antennae to be physically connected by coaxial cables or other types of transmission lines. The Event Horizon Telescope (EHT) will initially be composed of 12 radio observatories based all around the world with the objective of observing up close the black hole at the center of the Milky Way. (A prototype 6 telescope system has been running for some time.) 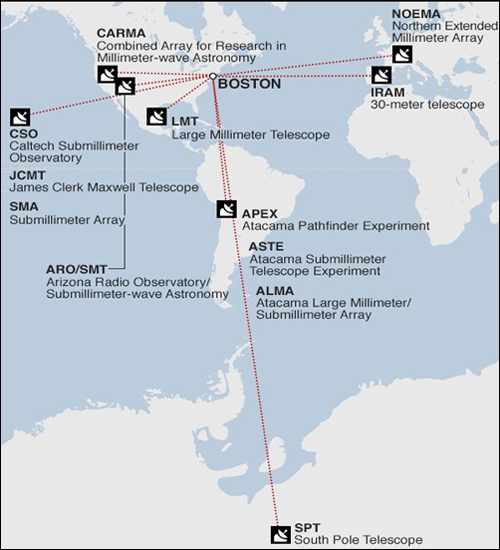 See the image to the left which shows radio telescopes in Hawaii, California, Arizona, Mexico, France, Spain, Chile and the South Pole. 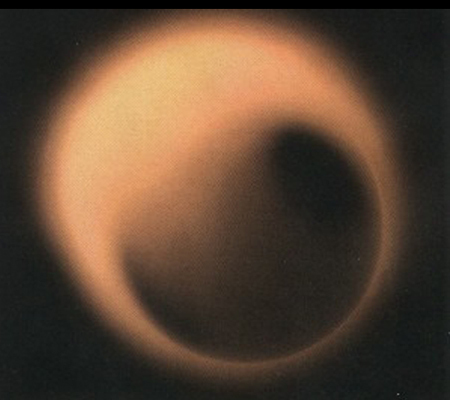 Through the technique of VLBI (see above) many independent radio antennae separated by thousands of miles can be operated in concert to create a “virtual” telescope with a diameter almost the size of the planet. As the separation between the telescopes making up the array has increased, the array's resolution increased and it is able to discern finer and finer details. Also, increasing the frequency of the equipment enhances the resolution. Both enhancements were implemented in 2016. The first full blown look at the Milky Way black hole will occur in the spring of 2017. Massive in weight, black holes are extremely compact, appearing as a tiny point in the sky through the most powerful single telescopes. Left by themselves black holes, like our Milky Way black hole, lie dormant with their mouths open. But when a passing star or gas cloud does come into their vicinity drawn in by the black hole's gravity, the gas or star is heated to billions of degrees as it swirls in the doughnut accretion disk. Black holes are sloppy eaters, and when they feed, jets of x-rays and other radiation are violently expelled into the surrounding area. Most people think of black holes as giant vacuum cleaners sucking in everything that gets too close. But the supermassive black holes at the centers of galaxies are more like cosmic engines, converting energy from in-falling matter into intense radiation. Jets of x-rays and other radiation are violently expelled into the surrounding areas. The Event Horizon Telescope was named after the point of no return "event horizon" of a black hole. Its job is to "see" what has been until now unseeable - a small, dark sphere of nothing, a tiny speck in the glow of radiation coming from the center of our galaxy. 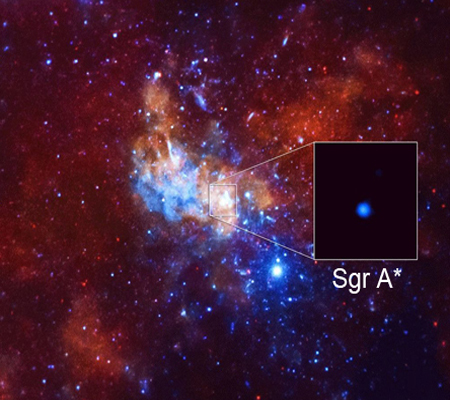 See Sagittarius A* (pronounced Sagittarius A Star and abbreviated Sgr. A*) to the left. Sgr. A* is the location of the black hole buried in dust and gas in the middle of our Milky Way galaxy 26,000 light-years away (150,000 trillion miles away). It is not visible in normal light. It can only be seen in infrared and x-ray light. It is there that astronomers believe a supermassive black hole lurks, a tiny trap hole into which the equivalent of four million suns have disappeared. What Does The Milky Way Black Hole Look Like? Although the Keck telescopes mentioned above have terrific resolutions for optical astronomy, they are far short of the resolution needed for detailed Sgr. A* observation. Hence the need to join many worldwide radio telescopes into one family and attempt to get down to a resolution of about 10 μas. However, getting all the family members in synch using atomic clocks is very tricky and time consuming. Also, processing all the data takes a fair amount of time because each telescope's data has to be tweaked to get all of the remote telescopes in exact time synch. The EHT has some intriguing possibilities for not only producing the first image of a black hole, but it will also test Einstein’s general relativity at extremes and might uncover physics beyond general relativity. With its unprecedented resolution, more than 1,000 times better than the Hubble Telescope, the EHT will see swirling gas on its final plunge over the event horizon, never to again be in contact with the rest of the universe. If the theory of general relativity is correct, the black hole itself will be a shadow because not even light can escape its immense gravity. Arizona Radio Observatory (ARO). The ARO is located on Kitt Peak, a 6,900 foot mountain in southern Arizona. In the 40 years since it was first built, the 12 meter ARO has been at the forefront of millimeter molecular astronomy: studying molecules in space through the use of molecular spectroscopy at millimeter wavelengths. Many of the molecules that have been discovered in the interstellar medium were discovered by the ARO. In 2013, the dish was replaced with ESA's ALMA "prototype" antenna, which had been located in New Mexico. Only very recent technological advances have made it possible to not only record radio waves at just the right wavelengths where they don’t interfere with water vapor in the atmosphere but also to ensure the ultra-precise timing necessary to combine observations from multiple telescopes thousands of miles apart into one exposure. Large Millimeter Telescope (LMT). The LMT is a 20 story facility with a 50 meter (165 foot) bowl antenna (the largest in the world) on one of the highest southern Mexican mountains and one of the main components of the EHT. It is a joint project consisting of 80% Mexican and 20% American funding by the Instituto Nacional de Astrofísica Óptica y Electrónica (INAOE) and the University of Massachusetts Amherst. Perhaps the most stunning application of the EHT will come when studying the flares Sgr. A* is known to periodically generate. Approximately once a day, multiple observatories have observed a flaring event that not only causes a brightening of Sgr. A*’s emission, but it also changes the structure of the emission region. These flares have been interpreted as “hotspots” in the accretion flow close to the event horizon. When the EHT is fully operational, it will be able to track these hotspots, tracing their origin and watch them diminish. Not only that, astronomers hope to use hotspots as a tracer to map out the "structure of spacetime" in this strong gravity environment. James Clerk Maxwell Telescope (JCMT). 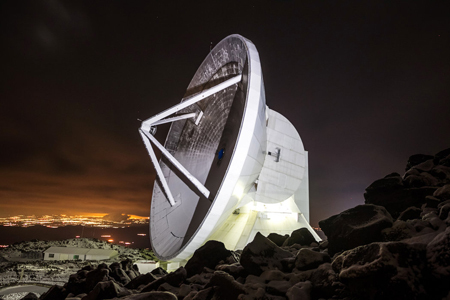 Its 15 meter (50-foot) dish looks at the sky with instruments that tell us about the cold universe in several different ways. Operating between the infrared and radio waves, observing at wavelengths between 1.4 and 0.4mm, it uses some of the most sensitive and sophisticated instrumentation to detect the coldest material in the universe only a few tens of degrees above absolute zero. 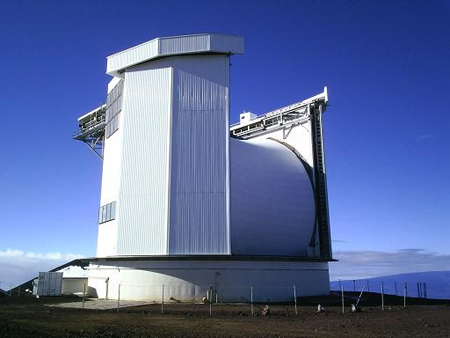 Water vapor in the Earth’s atmosphere intercepts this radiation, making the high and dry site of Mauna Kea, Hawaii vitally important for the research performed at the JCMT. Processing the data from the 12 high altitude observatories is not an easy task. First off, when conventional hard drives were used at the remote sites, 85% of them failed due to the low air pressure at extreme heights. The low air pressure at 15,000 feet caused the magnetic heads to crash into the platters. The replacement hard drives had to be helium filled which are hermetically sealed from the outside air. The new drives not only solved the low-pressure problem, but also offered double the storage capacity. An enormous amount of data is collected for each 5 day run. Each radio telescope typically collects 900TB of data per 5 day run. That data is then stored on about 1,000 hard drives, which amounts to about a petabyte (PB) of total stored data. In theory these black holes were thought to be powered by magnetic fields. For the first time EHT astronomers, using only three telescopes, have detected magnetic fields just outside the event horizon of the black hole at the center of our Milky Way. In Sgr. A* polarized light is emitted by electrons spiraling around magnetic field lines. As a result, this light directly traces the structure of the magnetic fields. "These magnetic fields have been predicted to exist, but no one has seen them before. Our data puts decades of theoretical work on solid observational ground," adds principal investigator Shep Doeleman, who is assistant director of MIT's Haystack Observatory. See an artist's conception of the Milky Way Black Hole to the left. The object in the upper center of the black hole diagram is a corona (never seen by a human, only hard x-rays have been observed). 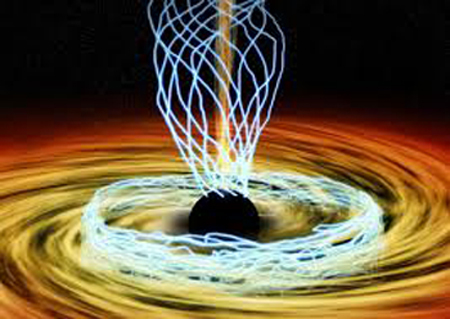 The EHT team found that magnetic fields in some regions near the black hole are disorderly, with jumbled loops and whorls resembling intertwined spaghetti. They also found that the some magnetic fields fluctuated on short time scales of only 15 minutes or so. In contrast, other regions showed a much more organized pattern. The results appear in the December 2015 issue of the journal Science. "Understanding these magnetic fields is critical. Nobody has been able to resolve magnetic fields near the event horizon until now," says lead author Michael Johnson of the Harvard-Smithsonian Center for Astrophysics (CfA). "Once again, the galactic center is proving to be a more dynamic place than we might have guessed," says Johnson. "Those magnetic fields are dancing all over the place." The Event Horizon Telescope (EHT) was switched on April 4th, 2017 after several years of preparation. As the final observation run ended about 11am ET on April 11th, team member Vincent Fish sat contentedly in his office at the MIT Haystack Observatory in Westford, Massachusetts. For the past week, Fish had been on call 24/7, sleeping with his cell phone next to him. The telescope network had been approved to be switched on for a 10-day viewing window starting April 4th, but due to poor weather conditions, only five nights were available. Naturally, to see the shadow of an event horizon, the black hole a) needs to be massive, and b) relatively close. All 12 telescopes simultaneously produced data from two supermassive black holes: Sagittarius A* (Sag. A*) at the heart of our Milky Way galaxy, and another black hole about 1,500 times heavier at the core of galaxy Messier 87 (M87), an elliptical galaxy 53 million light years away. 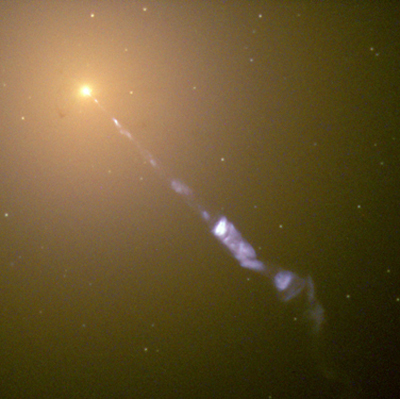 See the photo of M87and its jet to the left. Although M87 is 2,000 times further away from earth than Sag. A*, due to its huge mass, the M87 event horizon shadow should be bigger than Sag. A*’s. “What we expect to see is an asymmetric image where you have a circular dark region. That’s the black hole shadow," says Fish. "And there might be a bright ring at the edge of that, which is the photon ring (a spherical region of space where gravity is so strong photons are forced to travel in orbit). Then around it you will see one side is bright and the other side is faint, so kind of like a crescent. The reason for the crescent is that material near the black hole is moving at a few tenths of the speed of light. Special relativity tells us that when particles emit photons, if the particles are moving towards us, they look very bright, if they’re moving away from us, then it gets very dim. That produces this asymmetry.” See the blue image to the left - a simulation from Harvard of the black hole at our galaxy center. The drives must be flown to the EHT's processing centers at MIT Haystack and the Max Planck Institute for Radio Astronomy in Bonn, Germany. However, the hard drives from the South Pole telescope can't be flown out until the end of the winter season there which is at the end of October. Given all the data researchers will need to process, do not expect any images until 2018. The data, recorded on hard drives, is plugged into two correlators (supercomputers). This removes any time delays caused by the different global positioning of each telescope. “With the array we have, we should have plenty of sensitivity. If things went well, we should have clear detections, but we won’t know for certain until all the data gets back here,” Fish says. As of December 19, 2017 all the data from each of the radio telescopes has been gathered. It is being processed to filter out background noise and interference. For a short EHT video as of April 30, 2018, click here. The following statement is from Shep Doeleman, the EHT Director as of May 1, 2018: "As the EHT team analyzes the 2017 data on Sgr A* and M 87 over the coming months, preliminary images will begin to emerge, and the searches for the signatures of orbiting material around the black holes will be conducted. It is the most exciting time of the project. We will be sure to share what we find after we have put the data and analysis methods through "stringent tests" to convince ourselves, and independent astronomy colleagues, of what these horizon-resolving observations tell us." Success At Last - A Look At M87! It has been more than a decade since the Event Horizon Telescope's (EHT’s) bold imaging plans were first begun. Scientists have patiently waited as existing facilities were upgraded, new facilities were built, and technical conditions and weather were right to obtain a good look at a black hole. The black hole at the center of our galaxy, Sagittarius A* (Sgr A*), the nearest supermassive black hole, suffers from a host of complicating factors for imaging. This monster’s rapid change, plus its position in the galactic plane where it’s blurred by the interstellar medium, provides challenges that must be overcome to accurately capture it. So the EHT team turned its attention to Messier 87 (M87) a supergiant elliptical galaxy in the constellation Virgo, 55 million light-years from earth (as opposeed to 26 million for Sgr*). Despite Sgr A* being about half the distance, it is much more dynamic than the black hole at the center of M87. SGR* changes on a scale of minutes rather than days. 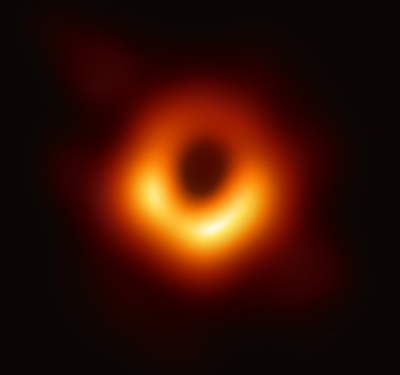 M87 may be further away, but its black hole is a thousand times larger than Sgr A*, giving it longer and more manageable variability timescales. The EHT also was peering through much less of a interstellar medium when pointed at M87. These factors contributed to making the neighboring black hole in M87 more accessible for imaging — and, consequently, it turned out to be the first choice for the EHT. The EHT is an extensive virtual telescope created by combining simultaneous observations from radio arrays and dishes all around the planet. 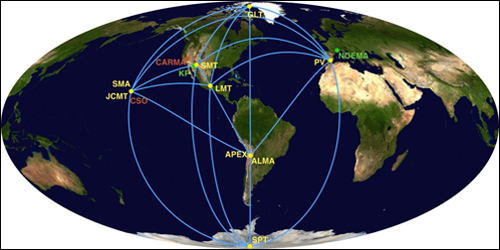 During April 5th through 11 in 2017, the EHT observed M87 on four separate days using an array that included eight radio telescopes at six geographic locations: Arizona (USA), Chile, Hawai'i (USA), Mexico, the South Pole, and Spain. 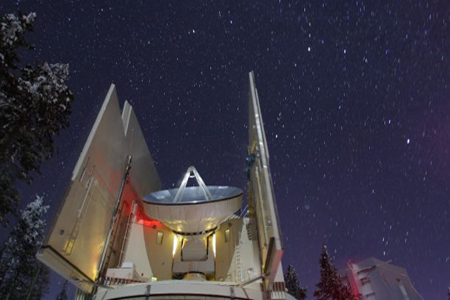 The telescopes caught whatever light it was able to detect from near the black hole. By combining the data from the various telescopes from around the world, the EHT has as much magnifying power as a telescope the size of the entire earth. The EHT was able to achieve unprecedented resolution. It can resolve down to 50 millionths of an arcsecond (uas) at its observing wavelength of 1.3 millimeters (mm). Years of preparation (and an astonishing spate of planet-wide good weather) paid off with an extraordinary multi-petabyte (million gigabytes) yield of data. The results were presented by a team of instrument, algorithm, software, modeling, and theoretical experts. This followed a tremendous effort by a group of scientists that span all career stages, from undergraduates to senior members of the field. More than 200 members from 59 institutes in 20 countries and regions have devoted years to the effort, all unified by a common scientific vision. A defining feature of the images is an irregular but clear bright ring, whose size and shape agree closely with the expected lensed photon orbit of a 6.5 billion solar mass black hole. The image of the shadow confines the mass of M87 to within its photon orbit, providing the strongest case for the existence of a supermassive black hole. These observations are consistent with Doppler brightening of "relativistically" moving plasma close to the black hole. The observations produced an enormous amount of data that had to be stored on hard drives and then flown to Germany and Massachusetts where it was distilled to a more usable volume by supercomputers. Then scientists could analyze and reconstruct the images. The researchers were able to calculate the mass of M87* at 6.5 billion times that of the Sun. Previous estimates — based on models as well as spectroscopic observations of the galaxy by the Hubble Space Telescope - range between 3.5 to 7.7 billion solar masses. EHT scientists also deduced the radius of the event horizon to be 3.8 micro-arcseconds. They also found that the rotation of the black hole is in a clockwise direction, and that its spin points away from us. The brightness in the lower part of the image is due to the relativistic movement of material in a clockwise direction because that portion is moving towards us. Why is the southern part of the ring brighter? As fast-moving material rotates around the black hole, it speeds toward us on one side and away from us on the other. On the side of the ring where matter moves toward us, a relativistic effect beams light in our direction, causing this region to appear brighter. The measurements are taken at a wavelength the human eye cannot see, so the astronomers added color to the image. They chose “exquisite gold because this light is so hot,” said Jessica Dempsey, a co-discoverer and deputy. With previous observations of M87’s jet, that show it’s inclined at an angle of 17° relative to our line of sight, this tells us that M87’s black hole likely spins clockwise from our point of view, with its spin axis pointed away from us at an angle. In the coming years, the EHT team will extend their approach to include the full polarization of electromagnetic waves, mapping of magnetic fields, investigations of black hole time variability, and increased resolution through shorter wavelength observations. With some or all of these improvements, the EHT team intends to re-visit Sgr* down the line.